Get Your 2015 Holiday Treats! I'm winding down for 2014. And what a great year it's been! * Steve Lowenthal, Kineo US CEO, shares his insights from the recent CLO Symposium in San Diego: 5 Things CLOS are Thinking About Now. Be interested to hear from you if these findings reflect what's going on in your own organizations. 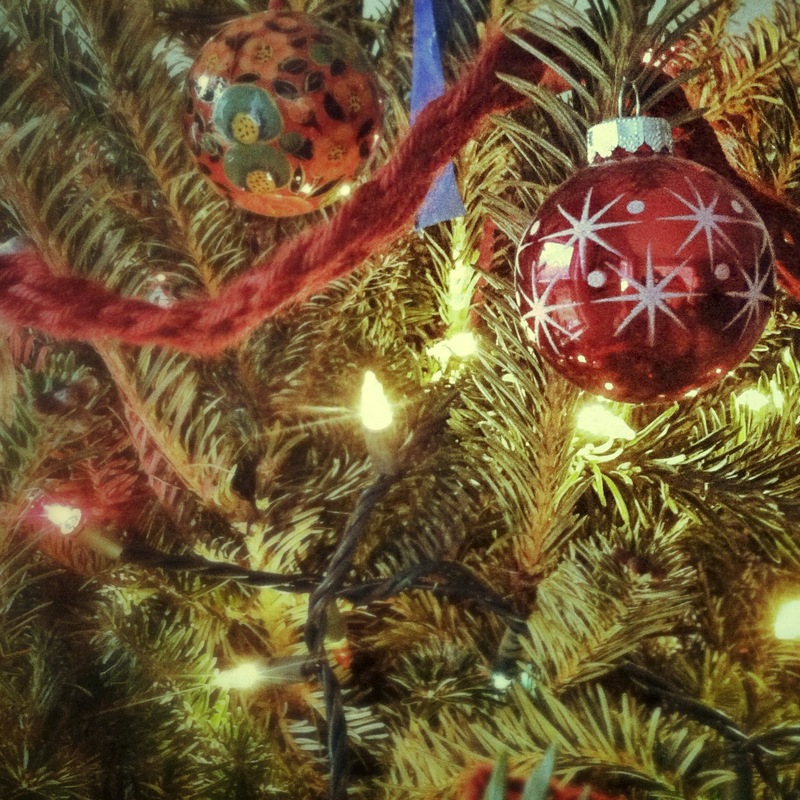 * And my favorite: a delightful wrap-up of all our top posts from 2014 on kineo.com. Unwrap your favorite today! I'm looking forward to the return of longer days and am so very pleased we're over the Solstice hump already. Meanwhile, I'll be hunkering down with hot cocoa and my kids over the next few weeks, gearing up for another great year ahead. Looking forward to a fantastic 2015 and for your continued community and conversation along the way. eLearning Guild online webinar with Steve Foreman (InfoMedia Designs). These are my live blogged notes. Here's the event page describing the webinar. What is an ecosystem and why build it? To enhance individuals and orgs by connecting people with a broad range of techs that drive performance. There's formal training -- and then there's all of the ways that we learn within the flow of work (performance support, collaboration, access to experts, knowledge management. ALL of these are included in an ecosystem. Guild research: We continue to see a trend to replace more scheduled training (classroom, webinars, etc.) with more on-demand training. And we see a trend to provide more options for learning within the work environment and the workflow. Talent Management: people have competencies, they need them, jobs requirement them. Talent management options match up people with competencies, identify gaps -- allows you to improve in your current job or prepare for the next one. A searchable knowledgebase, publishing/workflows, curated, analytics -- giving people access to the info they need when they need it. A directory of experts in your org (could be Sharepoint). You're interested in getting guidance on a topic - you search your org to find who has that expertise. You can read their profile, see what they've written/published, see how others have rated them, see how to contact that person. A valuable way to support people to connect and learn from each other. Formal learning for new hires, compliance, etc. Coaching is part of talent management. But you might also have a structured learning program that involves mentoring and shadowing. Cohorts may be part of structured learning, but could be part of social networking where cohorts work together to complete an assignments. These components aren't discrete. There's lots of overlap. Process: what's needed from a business perspective? What problems are you trying to solve? You need to look at HOW the work happens. Where are the bottlenecks and inefficiencies? That will help you identify where to provide work-based solutions. Each component has its own set of processes. When designing ecosystem solutions -- especially those built seamlessly within the workflow -- it needs to be kept alive and thriving. It's not a case of "we've delivered the course and we're done." So they require ongoing processes to maintain and keep the content relevant. Lots of different techs to support an ecosystem. Talent Management, software help, search engines, CMS, DMS, analysts, blogs, wikis, social network, authoring tools, LMS, assessments, etc. These can be loosely joined -- with a backend that lets you pull out data. They don't have to be tightly integrated. Your culture will determine how this goes down. You need management leadership and sponsorship. Tech advocacy -- partnering with your IT group. Content needs to managed and curated. Important to have ongoing ownership and control of your content. L&D function and its perceived charter -- if you think you're about training, then you won't go far with ecosystems. If others think you're about training and courses, it'll be hard to overcome that. You need to broaden your scope. In ecosystems you want to impact the work where and when it's happening. Budget, resources and time -- this may take time. How do we create ecosystem solutions? Design needs to focus on strategic links. 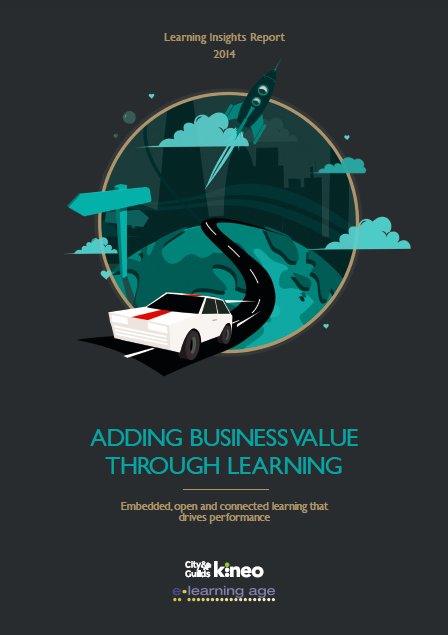 Your business strategy drives your learning strategy which drives your ecosystem architecture. Don't let the tech drive what you can do. First focus on what your organization is doing. Think strategically, analytically, holistically. Find out what keeps the exec leadership team up at night. Get access to top level execs.Be sure to identify that you're solving the right problems. Ask them "What do you see as our top five business goals over the next 3-5 years, and what are the challenges? What do you see as the top human performance challenges impacting those goals? This will build credibility, gain influence and sponsorship, and helps you focus your effort. Figure out where you should focus. Talk to middle managers. How does the work happen? What are the problems and why? How do you measure the problems? What are your business metrics? If you can clarify task, work outputs and workflows you'll set the right context. If you identify obstacles, bottlenecks, you'll uncover opportunities for your ecosystem. Prioritize by frequency, complexity, and level of impact. Pick the problems that are marked HIGH for all three dimensions and focus on those ones first. Then tackle the next tier. This will help you demonstrate impact. What kind of solution will increase productivity? Look at the components that you have available to you -- what you have right now that you can leverage. Establish metrics that are focused on those business metrics. This is what you want to impact. Identify the right components and your requirements. Start with the end in mind so you can establish your goal. Establishing a phased goal helps you deliver value at each phase -- you get started more quickly. Focus on productivity and not learning, then you'll be impacting business metrics -- what sponsors care about. If you focus on environment and not just content you'll find that content emerges from the users. Examples may not include all six components. Steve shares an example from a healthcare company that built off structured learning, performance support and knowledge management. Financial services: structured learning, talent management, knowledge management, access to experts. Wanted to decrease time to access and find information -- time spent searching for info rather than working with customers estimated at $11M/year. Created some standard learning paths for new hires, development plan creation/review/tracking, knowledgeable of product and sales collateral, product expert contacts w/office hours. Communications company: wanted to change their culture to move towards more of a solutions selling company -- where selling suites of products and solutions. So they measured revenue and the size of the sale. Their solution included knowledgebase, process based performance support, ask an expert, CoP, learning/mentoring program. All case studies driven by business problems. Each used different components or "recipes." Measured success using business metrics. Check out the Ecosystems: The Whitepaper from the eLearning Guild and the Ecosystems research report coming in January. 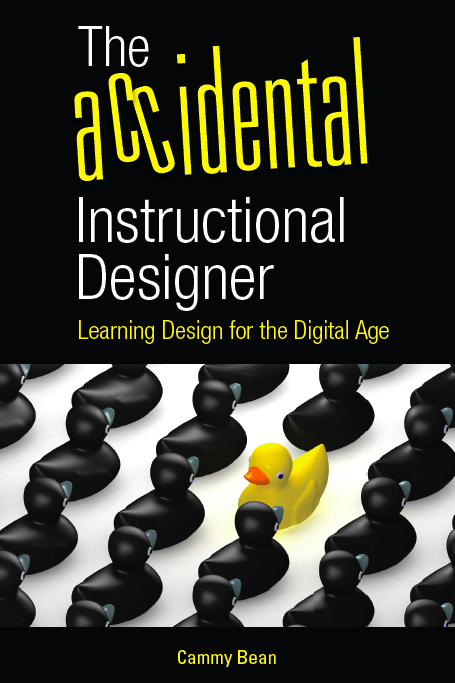 The Accidental Instructional Designer: More positive reviews! I continue to be blown away by the great reviews of my book, The Accidental Instructional Designer: Learning Design for the Digital Age. Five stars for five Amazon reviews! Thanks to everyone who have bought a copy and who continue to spread the word. The book has definitely struck a chord in the e-Learning ID community. Today, Jon Aleckson of WebCourseworks described me as a "frenemy" but then went on to share that he bought five copies of the book for his ID team! Read Jon's full review of the book on his blog. Last week I presented an encore performance for the eLearning Guild as part of their Best of DevLearn series: Design Models and Patterns for Creating Better eLearning. Jennifer Valley and Chett Bradley both used the word "awesome". Judy Albers said she could listen to me "digress all day". Missed the webinar and want to see what the fuss was all about? The eLearning Guild Recording is now up and running from start to finish! Check it out: Design Models and Patterns for Creating Better eLearning. Want more on Design Patterns? Read the Kineo Guide - Learning Models: Blueprints for Designers. Want more eLearning tips in general? Get the book: The Accidental Instructional Designer: Learning Design for the Digital Age and read all the Kineo Top Tips. eLearning Guild Best of DevLearn Webinar This Wednesday! Just a reminder to join me for a Best of DevLearn webinar with the eLearning Guild on Wednesday, August 20th, 1:00 eastern/10:00 pacific: Design Models and Patterns for Creating Better eLearning. Check out the results of this poll on I ran on my blog a few months ago, asking people for what devices they're currently creating content. What do you think? Does this reflect your organization's reality? How do you think this will change -- if at all -- in the next six months, one year, five years? If you haven't already, take the poll! Did you miss my session with Training Magazine a few weeks ago on The Accidental Instructional Designer? Never fear, the Training Magazine recording is up and available for your listening pleasure. Enjoy! I had the honor today to keynote the Chicago eLearning & Technology Showcase here in Naperville, IL. It's the summer of special events! Join me and the eLearning Guild for an encore performance of Design Models and Patterns for Creating Better eLearning on August 20th as part of the their "Best of DevLearn" series. Apparently, my session at DevLearn 2013 was one of the best-rated, most popular sessions! How cool is that? The Accidental ID: Join me for a Q&A Webinar Session on July 31st! Join me on July 31 (two times available to create a truly global thing of it!) for a loose and wild webinar, where we explore your burning questions about instructional design and eLearning. "What will I be when I grow up?" Most of us never imagined the answer to that question would be an Instructional Designer. Like Cammy, many of us fell into the role by chance. We learned along the way, experienced a few face plants and witnessed some major technological shifts. All of which we keep in our handy dandy back pocket of "experience." Others are just beginning their journey. Bright-eyed and bushy-tailed, these ID's are ready to take on the L&D industry. They've got the knowledge, sure. But even with that knowledge, they're secretly wondering,what did I get myself into? Instructional Design requires a special type of person. A person that can wear multiple hats and learn quickly. It's certainly not a role for the faint of heart. So how do you prepare for a career in ID and thrive - whether it's planned or accidental? Join us for our global 1-hour Q&A session with Cammy Bean, Kineo US VP of Learning Design and author of the newly released book, The Accidental Instructional Designer: Learning Design for the Digital Age. For more info and to register, head over to the Kineo website. See you online! Check out our video recap of #mlearncon! Already a fading memory, but #mlearncon was loads of fun this year. Join me for the Accidental ID Webinar Thursday July 17 with Training Mag Network! Are you an accidental ID? Looking to build more intention into your practice? Join me this Thursday, July 17 @ 1:00 eastern for free webinar with Training Magazine Network. I'll share my story, some tips, ideas and--hopefully--some inspiration! Register here and hope to see you online! Share Your Accidental ID Story & Win a Copy of My Book! Bryan Jones over at eLearning Art has posted an interview with me...AND he is giving away ten copies of my book to a few lucky winners who share their own Accidental ID story. So many of us landed in this field completely by accident? What's your story? Head over to Bryan's blog and share your story there for a chance to win! This week, it's been mLearnCon in sunny San Diego! A really great conference with an engaged community of practitioners actively solving problems and seeking out ideas and insights. I led a session on Thursday, riffing a bit off my new book. So many of us working in this field found ourselves here seemingly by accident. So we've been designing and developing eLearning all these years, and now a new twist has been added to our plates--making it mobile. These are my live blogged notes from the International Conference on eLearning in the Workplace (ICELW), happing this week in NYC. Forgive any typos or incoherencies. People use technology interchangeably -- we want to be able to access our information on any device. We learn by doing. We don't need a formal learning course. We learn by trying and failing. We need to put what we learn in the classroom into practice in our daily lives. We love to talk. Earliest forms of performance support = ask the guy sitting next to you. If he doesn't know, where do you go? It's how we learn, we're social beings. We also like to search. 6 billion google searches done every day. We google it. In our personal lives, if we don't know something, we look it up. Expectation is that it'll be at our fingertips. Problem is we don't do that in the L&D world. Where do we learn? 70% learn on the job; 20% learn through coaching; 10% formal classroom. But L&D professionals focus on that 10%. Instead we should focus on performance support to push it out onto the job. Sometimes all you need is performance support (particularly on moments 3-5). So how can we foster performance support? More and more clients looking for short, pithy resources to get messages across in a short way (and not asking for courses) -- shifting away from there's a training need to performance support and shorter resources -- e.g. short videos, q&a with experts, animations -- less than 2 minutes pieces that get across a specific short answer to a specific short question. This is what makes it so powerful. Quick reference, diagnostic tools, how to guides, job aids. (And these are available across your devices). Glossaries people can access on their mobile phones. Diagnostic tools to help you throughout your day. How-to Videos -- short videos on how to use the system. FAQs with experts -- taking the conversations you want to have with an expert, to scale it so everyone can get that info. Media types: podcasts, videos, infographics, whiteboard animations, screen captures, etc. 2. Embed performance support in the software you're using. Integrating information into SharePoint to help people see what's needed at each step of the way. 3. Helping people find resources with support portals and structures. Always think about how easy you can make it for people to find it. Can they find it in three clicks? Helping people learn and manage large projects. Created a portal that guides people through each stage of the process with example documents and guidance at each stage. Small training nuggets on each step. Guides them through the journey. Providing performance support to help people do their jobs. In a flow chart of your team's process, embed the documents and templates people need to be using. Think about gathering existing materials and giving it structure. Put a surface layer on top of all that material. You can drill down by clicking on steps in a process OR search by keywords. Design apps that give people the materials they need and when they need them. So people can refresh on those questions/info when they need it -- and when they might not be at their desk. Apps help people take things out into the workplace. Diagnostic tools that used to be in big paper manuals can go into a mobile app. The tools are out there to make it easy to provide short nuggets of info for multiple devices. It's all about transferring training to the workplace. Performance support helps us prop up the forgetting curve. Really it's about coming up with an integrated strategy. To use formal training along with performance support. It's not an either/or -- they need to be integrated. Coming down the pike - the future? Contextual performance support -- your phone knows where you are and what your next appointment is and can push info to you that you need -- before you even know you need it. Tin Can xAPI -- to gather data and share -- you took this training course, someone else who took that course found this info useful. Making training and info more personal and useful. Google Glass -- it knows where you are, it knows what time it is...what about first responders who will have access to an expert right in your helmet. As a diagnostic tool, could be really powerful. A hands free way of getting information. It's early days but some strong potential to provide performance support in an instantaneous way. Smart Watches -- technology that you'll have with you all the time. Good for: ensuring transfer of training into workplace and supporting new learning on the job. Support it with: flexible resources, portals, integration with existing software. Consider: Timing, connectivity, tracking (or not), phone features (what can you use that will add value? ).